The Mars 2020 rover requires electrical power to operate. Without power, the rover cannot move, use its science instruments, or communicate with Earth. Mars 2020 carries a radioisotope power system. This power system produces a dependable flow of electricity using the heat of plutonium's radioactive decay as its "fuel." The power source is called a "Multi-Mission Radioisotope Thermoelectric Generator" or MMRTG for short. The MMRTG converts heat from the natural radioactive decay of plutonium into electricity. 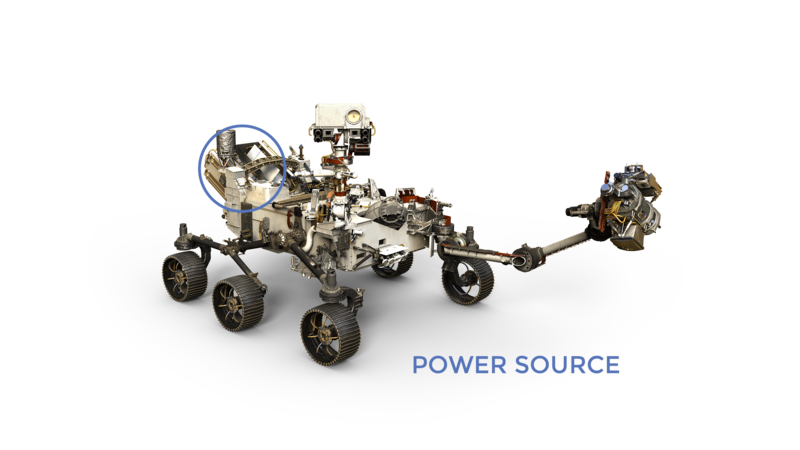 This power system charges the rover's two primary batteries. The heat from the MMRTG is also used to keep the rover's tools and systems at their correct operating temperatures. BATTERIES: Two lithium-ion rechargeable batteries to meet peak demands of rover activities when the demand temporarily exceeds the MMRTG's steady electrical output levels. RELIABILITY: The electrical power system on the Mars 2020 rover is just like the one used on the Mars Science Laboratory Curiosity rover. NASA has used similar power systems reliably for decades, including the Apollo missions to the Moon, the Viking missions to Mars, and on spacecraft that flew to the outer planets and Pluto, including the Pioneer, Voyager, Ulysses, Galileo, Cassini, and New Horizons missions. SAFETY: Built with several layers of rugged protective material to contain its fuel in a wide range of potential launch accidents, verified through impact testing. The heat source plutonium is manufactured in a ceramic form, which helps it avoid being a significant health hazard unless broken into very fine pieces or vaporized, and then inhaled or swallowed. In the unlikely event of a Mars 2020 launch accident, those who might be exposed could receive an average dose of 15-60 millirem. A resident of the United States receives, on average, 310 millirem of radiation each year from natural sources, such as radon and cosmic rays from space.